I decided to make sop buntut (Indonesian oxtail soup) one day but I realized I had pho noodles in my cupboard so diverted the plan and made a spicy oxtail pho instead. Now it’s not anything authentic but the flavor profile was definitely there (based on what I’ve eaten in Hanoi and Ho Chi Minh). I made the oxtail stock with oxtail, onion, spring onion, star anise, garlic and leeks. It simmered for a good two hours, and then I seasoned it with nam pla (fish sauce), salt, white pepper, chili powder and nam phrik pao (Thai roasted chili paste). 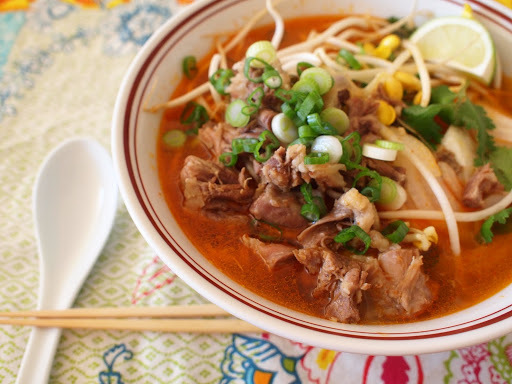 I was trying to create something close to bun bo hue, which is a spicy beef and pork knuckle soup with bun noodles. I didn’t have bun so I used pho instead. I still remember when I first had bun bo hue at this Vietnamese restaurant at the Esplanade when it first opened. It quickly became one of my favorite Vietnamese dishes, and when I went to Ho Chi Minh, I ate it three times. I wasn’t quite sure what all the meat was but I didn’t care. Anyway, I garnished this with a lime wedge, bean sprouts, sliced white onion, cilantro, spring onion and oxtail meat. 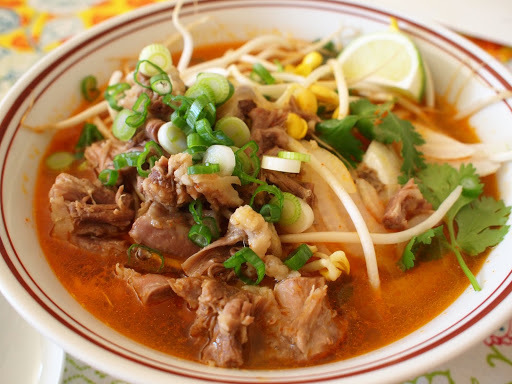 It was pretty close to being a bun bo hue and it was definitely satisfying!